To pack two meters of DNA into a microscopic cell, the string of genetic information must be wound extremely carefully into chromosomes. Surprisingly the DNA’s sequence causes it to be coiled and uncoiled much like a yoyo, scientists reported in Cell. Ha plans to use next generation sequencing to determine the flexibility of an entire genome. He hopes to create the first genome-wide map of physical properties. He also wants to find out if mutations can make the DNA easier or more difficult to read. This work was supported by the National Science Foundation, the National Institutes for Health, and the Howard Hughes Medical Institute. 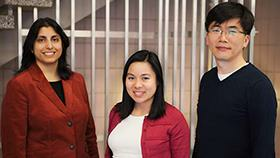 Ha’s research team included Thuy Ngo, a graduate research assistant; Jaya Yodh, Research Assistant Professor and CPLC Director of Education and Outreach; Qiucen Zhang, a postdoctoral research associate; and graduate student Ruobo Zhou. The paper, “Asymmetric Unwrapping of Nucleosomes under Tension Directed by DNA Local Flexibility,” is available online (http://dx.doi.org/10.1016/j.cell.2015.02.001).